I’ve been busy raising my kid and moving us into a new house, which is the reason for the non-posts. I didn’t even have TV for about a month, so I couldn’t even do my live-blogging of Cosmos. A team of astronomers announced today that they have discovered a planet (or rather, revised the mass estimate of a previously discovered planet) that is 17 times massive than our Earth, and 2.35 times as large. The planet is orbiting around a star called “Kepler-10” every 45 days and is designated as Kepler-10c, the second planet in that system. Since the star is very similar to our Sun (but a lot older ~ 10 to 11 billion years, compared to our Sun’s 4.5 billion years), the short orbital period means that the planet is very hot (~310 C, about three times the boiling point of water). The first planet in this system, Kepler-10b, which is about three times more massive than the Earth, is even worse: It orbits the star every 0.83 days (20 hours)!, making it one of the hottest rocky planet (~1895 C, about the melting point of the metal Chromium). These two planets were discovered back in 2011. At that time, astronomers could only put an upper limit on the mass estimate of Kepler-10c, ~ 20 Earth mass, the second planet in the system. Now, they have obtained more data and found a more precise estimate of the mass: 17.2 Earth mass. This is surprising, considering that the radius of the planet is ‘only’ 2.35 Earth-radii. And that means it has a higher density than the Earth (Kepler-10c density = 7.7 grams/cm^3, Earth density = 5.5 grams/cm^3), which in turn means it has a rocky composition. Now, just giving you the numbers about mass, radius of this planet doesn’t make quite an impression, or the convey the significance, of this discovery. So here is a cartoon drawing that I thought would help (I hope!). Fig. 2: Comparing the size of Kepler-10c with Earth and other smaller extrasolar planets. 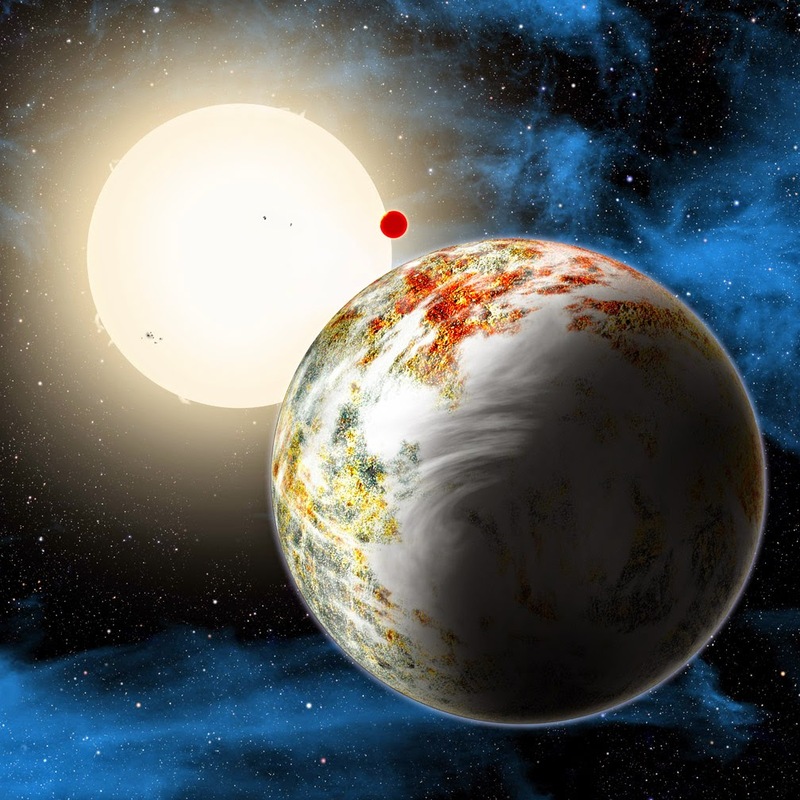 Kepler-10c is one of the densest terrestrial planet discovered to date. Assuming a typical ‘stick-figure’ person’s height represents theradius of a planet, and the size of the belly represents the mass, Fig. 2 shows comparisons of different extrasolar planets, including Kepler-10c, to Earth. Look how squished is our Kepler-10c cousin! And for a good reason: Our cousin is trying to tuck his body mass into a similar height as some of the smaller planets. The only way he could do it is to squish or compress enough to fit inside that height! When you try to do this, the amount of mass per ‘height’ increases. In other words, our cousin is trying to put more of his body mass in per unit area than us. So his density increases; which is the case for Kepler-10c. Our traditional/general view is that planets massive than 10 to 12 Earth masses are probably not rocky, because beyond this limit they accumulate gas from surroundings during their formation, and become gas giants (like Jupiter or Saturn) or ice giants (like Neptune or Uranus). But Kepler-10c, with a mass of 17 Earth masses, which is way beyond the 10 Earth mass limit, appears to be rocky. There could be many reasons (may be it formed after gas dissipated in that system, accumulating only solid particles. Or may be it indeed accumulated gas, but being so close to it’s star, the gas envelope got blown away, and what we see is only the left over mantle/core of the once gas-planet. The star is old, so the planet had some time to bask in this radiation). We don’t know….yet. But this discovery could pave the way for more such planet discoveries, probably in the habitable zones. And it could also mean that potential habitable worlds come in all sizes and masses, each with unique characteristics.